We all get birthday invitations. 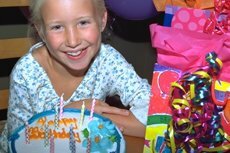 But, I'd be willing to bet that you see a lot of your birthday parties through your camera's viewfinder. That's what family photographers do! These photo tips come from our friends at Kodak...plus some based upon my personal experience. I hope you'll find these ideas useful. 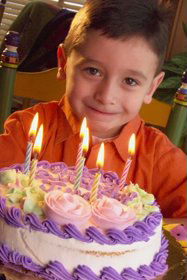 Whether it's baby's first, junior's sixth, or great-grandmother's ninetieth all birthdays mark a significant event. As your family's photographer you're recording moments in time to create a story that will become more important with passing years. 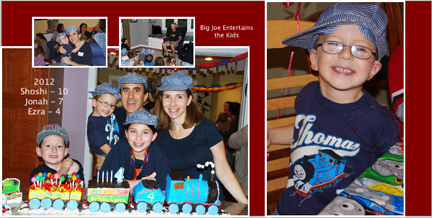 Your job is to take pictures of his sixth birthday that he can show to his children...and maybe grandchildren! Birthdays are markers in your family's continuing story. Photo books are a great way to record your history ... one event at a time. In a photo book you can dramatically bring a series of pictures together to tell the story of a special day. For an impressive book try mixing & matching your layouts. Incorporate a few panoramic spreads covering two pages. Order additional photo books for other family members...especially grandparents! Consider storing your photo book, a CD-R copy of your still shots and your video DVD together. Keeping the DVD's and the CD's envelopes with the photo book is a simple, foolproof system to prevent losing valuable memories. Having the images immediately available is also convenient when you want to order reprints ... even years later. You've seen plenty of photo books. They're nice. But, ours are better. Why? We use archival Kodak photographic paper...not plain printed paper. The color saturation on any plain paper book is limited. The color...at best...is so-so. When you order one of our photo books your color pictures will really pop! These are real photographs; not photocopies. 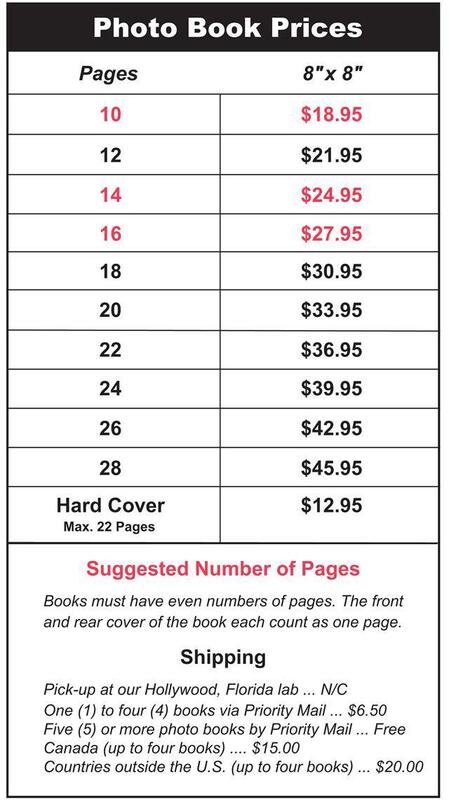 Best yet, our books cost less. 1. Click here to learn how to use our free online design software. 2. Follow the easy instructions. All you have to do is drag-and-drop your images into our pre-designed templates. 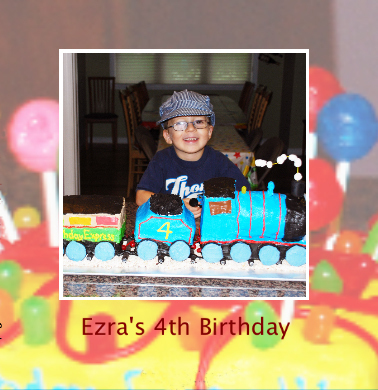 Then, by clicking Options you'll be able to change backgrounds and borders to add pizzazz to your photo book. 3. Place your order online. Your beautiful, finished photo books will be mailed to you. Local customers can pick them up at our lab. 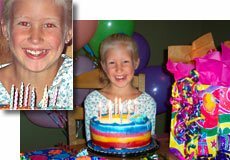 It takes only 20 - 30 minutes to create & order a fabulous photo book with our easy-to-use online software. If you have any questions please call us at (800) 327-1776. We're here to help! Catch the grins, tears, surprises, and hugs that make for memorable pictures. Keep your camera turned on so you'll be ready for those spontaneous expressions. Did you notice that I used the word "camera?" Cell phones are great for doing all sorts of things, including making phone calls. To take pictures of important life events you need to have the flexibility of a zoom lens, a reliable flash and a camera that will give you top quality images. To capture the light from those burning candles, turn off your flash. Hold the camera extra steady on a railing, the back of a chair, a table, or against a door frame to prevent blurry pictures. Or, use a tripod, such as an inexpensive tabletop model or a monopod. Fill the camera's viewfinder or LCD display with your subject to create pictures with greater impact. Step in close or use your camera's zoom lens to emphasize what is important and exclude the rest. Be sure not to take your picture closer than your camera can focus. If you are that close, set it to a close-up mode. Red eye is easy to remove these days with picture editing software or at a Kodak Picture Maker. But why not prevent red eye in the first place? Turn on the computerized red-eye reduction in your camera if it has that feature. Don't use the bright light or the flickering pre-flash on some point-and-shoot cameras. These lights cause people to blink and "telegraph" when you're about to take your picture. Consider using a dSLR with a pop-up flash instead of a point-and-shoot. These SLR flashes rarely produce red-eye. Get closer to your subject if you are using a point-and-shoot rather than zooming in from a distance to minimize red eye. Ask your subject to look at your shoulder rather than directly at the camera. Typical digital point-and-shoot cameras have a flash range of from 6 to 10 feet. Digital SLRs may go up to 15 feet. Subjects that are outside the flash range will be either too dark or too light. Try to keep your subjects in the same focusing plane (as in this example.) This will give your lighting a more even look. Use a supplementary flash if you own one. You'll expand the range of photographs you can take. The beauty of a digital camera is that you have the ability to immediately see your pictures. Use it! Check your subjects for closed eyes or poor expressions. Look critically at the exposure and focus on each of your shots. Reshoot...when you can... any pictures that aren't 100% to your satisfaction. At the same time, keep your eye on the party. Delete any "misses" later. A birthday shoot is not a wedding. But, if you're the family photographer your reputation is still on the line. Wouldn't you be crushed if your camera stopped? How about your memory card? An extra card...in case your primary one fails...is just a few dollars. It's worthwhile insurance! Snap a few test pictures to be sure everything is working right...before you get to the party. 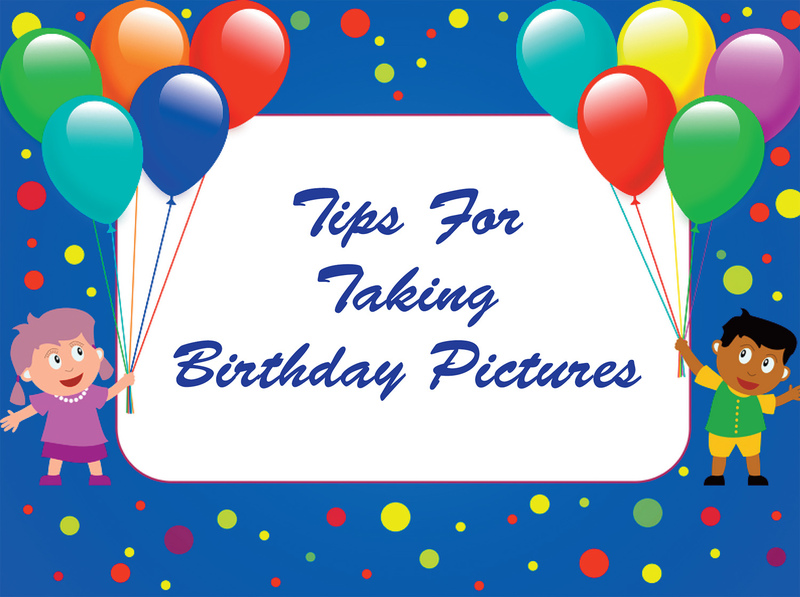 Tip #8: Put Your Pictures Online Today. Think Archival For Tomorrow. Facebook and other sites are great for sharing immediate images. Just remember that today's birthday is yesterday's news. It will be "buried" as time moves on. Back up your pictures with CDs and online storage. This can save your pictures in case your hard drive crashes. 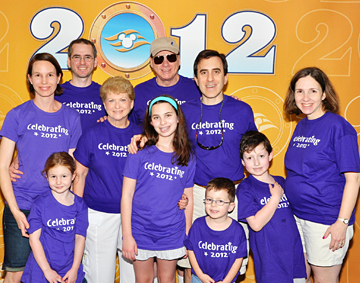 Printed pictures are the best way to preserve your special events for future generations. 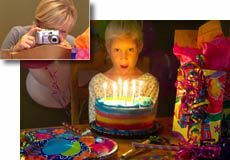 The only way to insure that your images are there for your children's children is by printing at least the best of your photos onto real photographic paper. 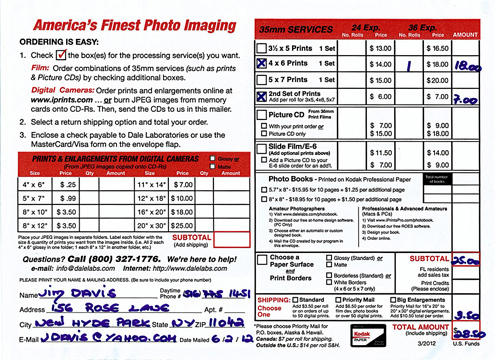 Prints on today's Kodak photo paper will last 100 years and viewing them will not be dependent on ever-changing computer technology. Here's some advice from a grandfather. Life goes by quickly. Blink twice and your children will be all grown up. All you'll have left are the memories and your pictures. So, take photos of your life events as if they're important. Because, they really are! Then, make archival prints and photo books to preserve your family's history. We'll do our part...treating your pictures with the same care we give our own. You snap the pictures ... we'll do the rest! Questions? Call (800) 327-1776. We're here to help! Be sure to visit and Like us on Facebook to take advantage of daily sales and special offers!